"Ghost Wall has subtlety, wit, and the force of a rock to the head: an instant classic." "A worthy match for 3 a.m. disquiet, a book that evoked existential dread, but contained it, beautifully, like a shipwreck in a bottle." The light blinds you; there's a lot you miss by gathering at the fireside. For two weeks, the length of her father's vacation, they join an anthropology course set to reenact life in simpler times. They are surrounded by forests of birch and rowan; they make stew from foraged roots and hunted rabbit. The students are fulfilling their coursework; Silvie's father is fulfilling his lifelong obsession. He has raised her on stories of early man, taken her to witness rare artifacts, recounted time and again their rituals and beliefs—particularly their sacrifices to the bog. Mixing with the students, Silvie begins to see, hear, and imagine another kind of life, one that might include going to university, traveling beyond England, choosing her own clothes and food, speaking her mind. 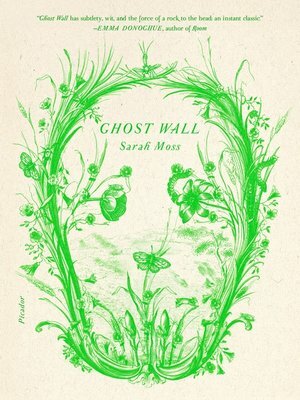 A story at once mythic and strikingly timely, Sarah Moss's Ghost Wall urges us to wonder how far we have come from the "primitive minds" of our ancestors.